How scrappage works | What Car? As you may well expect, the 2000 scrappage incentive for new car buyers launched in the budget isn't a free-for-all, no-strings-attached, offer. The hoops you must jump through aren't too difficult, but you'll need to negotiate them before March 2010 at the latest, when the scheme comes to an end. That is, unless, the 300 million the Government has set aside for the incentive is used up before then, in which case it will finish earlier. Don't go and buy a 50 wreck off eBay and expect the cuddly Government to give you thousands for it. To qualify, your car must have been registered to you for at least 12 months up to the order date of your new car, and have been first registered before 31 July 1999. It must also have a valid MOT certificate and be taxed. The 2000 incentive is split 50/50 by the Government and car industry. Manufacturers and dealers aren't compelled to take part, however, which may mean the model you want, or the showroom around the corner from your house, isnt participating. In which case you won't get a bean from Mr Darling. 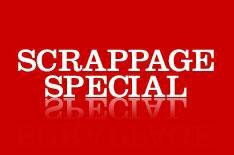 If you've got a car to scrap, but you don't know where the best deals are, or which new model to go for, email us by clicking here [Your scrappage questions answered](mailto:will.nightingale@haymarket.com?subject=scrappage questions).